Components of the HP3 heat flow probe. Top left: the radiometer (RAD), which is used to measure the radiation temperature (roughly equivalent to the ground temperature) of the surface. Right: the casing with the mole penetrometer, the temperature measuring cable (TEM-P) and the data cable (ET) connected to the lander. In addition, the casing contains an optical length meter for determining the length of the temperature measuring cable that has been pulled from the casing. The mole contains the TEM-A active thermal conductivity sensor and the STATIL tiltmeter. Bottom left: the electronic control unit, known as the back end electronics (BEE), which remains on the lander and is connected to the probe via the ET. Credit: DLR. In determining the heat flow, the increase in temperature with depth, referred to as the geothermal gradient and the thermal conductivity are measured. The latter measures the rock's ability to transfer heat. Multiplying these two values together gives the heat flow – in other words the amount of heat that flows to the surface per unit of time and per unit of surface area – and is released from there into the atmosphere. Geothermal gradient measurements may be distorted by heating cycles, which cause regular temperature variations on the surface (diurnal cycle, changing seasons), and these influence the underground temperature at different depths. In some places on Earth, the geothermal gradient has been measured at depths of up to several kilometres. People are aware of geothermal gradients from mines, whereby it becomes increasingly hot the deeper one goes, and from geothermal energy. Due to the extensive technological requirements and thus the very high cost of conducting such measurements in many different places, this is not an option on Mars. The scientists behind HP3 have agreed on a target depth of five metres, because from three metres down most of the seasonal temperature variations are likely to cause only negligible interference with the measurement results. There then remain another two metres in which to measure the geothermal gradient. Sketch of the temperature measuring cable showing the depth of the sensors. Credit: DLR. The DLR HP3 heat flow probe shown in the diagram above will measure the geothermal gradient by driving a small penetrometer, known as 'the Mole', into the ground. The Mole will pull a ribbon cable equipped with 14 temperature sensors behind it. During the flight to Mars, after the landing and before entering the ground, the Mole and the TEM-P temperature measuring cable will be stowed in a casing known as the support structure (SS). Once the probe has reached its target depth, the temperature will be measured by all of the sensors every 15 minutes for several months. The duration of the measurement process will depend on the depth reached and the thermal conductivity of the subsoil. Under the conditions assumed during the development of the device, penetrating the soil to a depth of five metres would require two to three months of measurements. 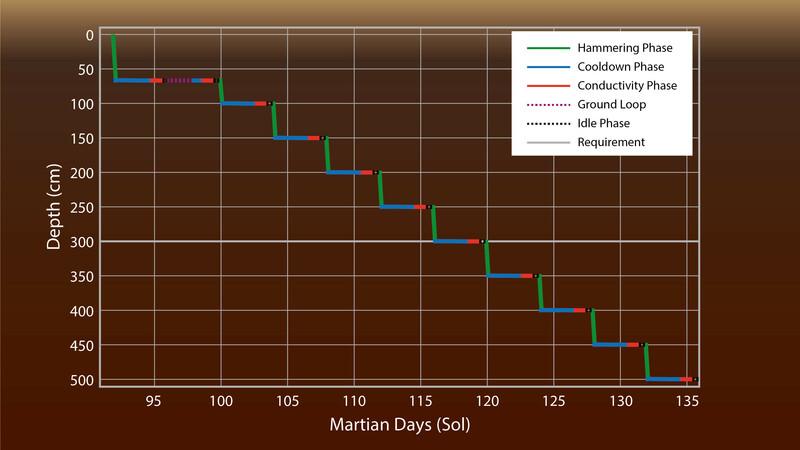 For a penetration depth of only three metres, the measurement would have to be performed for a full Martian year (approximately 24 Earth months), recording one full annual cycle. Under these circumstances and with the assumption that temperature differences between the sensors can be measured with an accuracy of 0.5 percent, depth differences can be determined to one percent and the error margin for the thermal conductivity measurement is 2.5 percent, uncertainty about the heat flow is less than ±2 milliwatts per square metre. In fact, assuming that the measurement errors are randomly distributed, this accuracy would equate to one standard deviation. The depth reached will be determined by measuring how much of the temperature measuring cable has been reeled out, and the inclination of the mole is recorded on a continuous basis. Sensor on the temperature measuring cable (centre). The temperature sensors are PT100 sensors with an accuracy of one millikelvin. Feed lines to other sensors and the mole can also be seen. The markings along the edge allow optical measurement of the length of the measurement ribbon cable that has been extended and, when used together with the inclinometer, allow the depth of the Mole to be determined. Credit: DLR. The Mole penetrometer was developed at the DLR Institute of Space Systems. It draws upon earlier developments at DLR and in Russia. An earlier version of the probe was built at the former DLR Institute of Space Simulation in Cologne as a sample collector for the Beagle II lander – flown as part of the Mars Express mission – which crashed onto the Martian surface in 2003. The hammering mechanism for the HP3 mole was developed by Astronika in Warsaw, Poland. Sectional view of the Mole penetrometer. The electric motor in the centre of the probe (blue) uses a rotating mechanism (green and brown) to tension the main spring near the tip (grey), to which the hammer (purple) is attached. After one rotation, the spring is released and the hammer accelerates forwards, where it then hits the inside of the tip, which acts as an anvil. At the same time, the motor is accelerated backwards. This movement is absorbed by a spring (above the electric motor) and again directed forwards, resulting in a second, weaker blow. The masses and springs are designed in such a way that the probe acts like a mechanical 'diode'. It penetrates the ground as the friction from the walls absorbs the recoil. An tiltmeter and the connection with the temperature measuring cable are located at the top of the probe. Both are protected from mechanical stresses by specially designed damping springs. Credit: DLR. HP3 will measure the thermal conductivity of the soil roughly every half metre as it descends to the target depth. To do this, the Mole’s outer shell will be heated with constant electrical power and its temperature monitored. The increase in this temperature is inversely proportional to the thermal conductivity. If the thermal conductivity is low, the temperature increase is high, and vice versa. Similar technology is used in thermal needle sensors. The Radiometer (RAD) will measure the thermal infrared radiation from the surface of Mars and gauge its radiation temperature, which corresponds approximately to the actual surface temperature. This is useful for interpreting temperature readings at various depths, as it can record the trend of the surface temperature. The RAD will also measure the thermal inertia of the surface of Mars, which allows conclusions to be drawn about the top few centimetres of the Martian soil. The RAD is mounted underneath the platform of the lander and will monitor the area beside the lander where HP3 will be installed. During the flight to Mars, the instrument will be mounted on the deck of the lander and remain there after the landing on 26 November 2018. The instrument will be deployed in early January 2019. During the waiting period, the camera and the HP3 radiometer will be used to explore the landing site and find the most suitable site for deploying the seismometer and the heat flow probe. This search is, however, limited by the range of the robotic arm (see diagram). SEIS will be deployed first, in December 2018. The area in which the SEIS and HP3 instruments can be set down by the robotic arm is outlined in dark blue. It is important to ensure that, as far as possible, HP3 does not lie in the shadow of the lander or SEIS, so a spot within the segments shown in green will be sought for this experiment. Credit: DLR. During the search, it will be important to avoid rocks and select as level an area on the surface as possible. The site should also be as far from the lander and SEIS as possible in order to avoid shadows, as these would affect the temperature profile beneath the ground. The process of burrowing into the ground will begin after the instruments have been released. This ‘drilling’ is planned to take place in stages, as shown in the diagram below. After proceeding half a metre, the hammer will pause for a day in order to allow the frictional heat created in the ground to dissipate. The thermal conductivity will then be measured. This process will be repeated until the target depth is reached. The possibility that the probe may not reach its target depth cannot be completely excluded. If this happens after a depth of three metres has been reached, the measurement period can be extended to compensate. If this depth cannot be reached, the accuracy of the measurements will suffer. Once the target depth has been reached, the experiment will proceed with long-term temperature measurements to determine the geothermal gradient.